For the second year in a row, this small liberal arts school is the most expensive college in the U.S. when you account for the published "sticker price" of tuition, fees, room and board. But it could be worth the cost. All students earn degrees in either a science, tech, engineering or math field and are known for landing high-paying jobs at companies like Google, Amazon and Microsoft as soon as they graduate. And like most colleges, a lot of students aren't footing the whole bill because they receive scholarships and grants from the school, state and federal government. 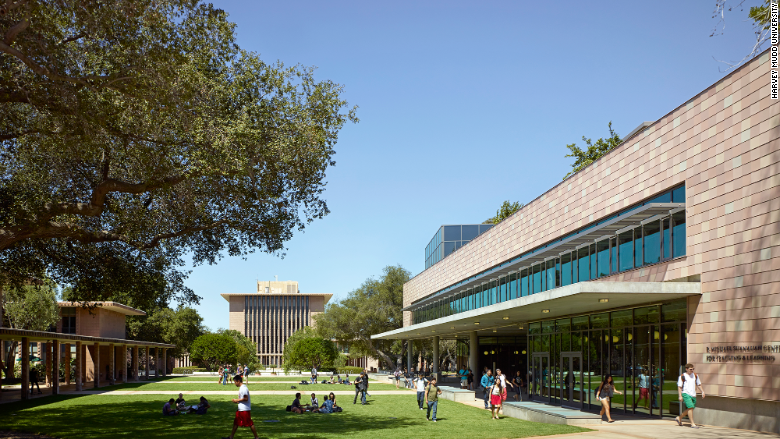 At Harvey Mudd, about 70% of students are paying less than the sticker price. Source: The total annual cost was analyzed by the Chronicle of Higher Education based on 2016-2017 data from The College Board. Financial aid 2014-2015 data comes from the National Center for Education Statistics. The total annual cost includes tuition, fees, and room and board for full-time, undergraduates. The share of freshmen with financial aid includes those who received grants and/or scholarships from the school, state or federal government.